To gaze across Hong Kong’s harbour to the city’s famed skyline of shimmering skyscrapers and lush, green peaks is to experience one of the world’s most spectacular urban landscapes. Hong Kong’s “fragrant harbour”, from which the city takes its name, is often obscured by smog. The city’s air pollution regularly exceeds levels recommended by the World Health Organisation and by some estimates air quality is three times worse than London or New York. Much of the air pollution is generated by the coal-fired power plants and smoke-stacks across the border in China’s industrial south, but the traffic fumes from the city’s increasingly congested streets also play a large role. “When I first arrived it was almost as though I could reach out and touch the mountains on the other side of the harbour,” says Rob Chipman, the boss of relocation firm Asian Tigers and the chairman of the American Chamber of Commerce, who has lived in Hong Kong for 25 years. The city’s worsening air quality is making it harder for businesses to retain and hire international staff, eroding Hong Kong’s appeal as a place to live and work. A survey of more than 200 international and local companies operating in Hong Kong released in May by the office space provider Regus, suggests that three out of four companies said that the poor air quality was making it harder for them to attract and retain employees from overseas. It’s not just the wealthier expats that are put off by the poor air quality. A poll by think tank Civic Exchange in December found that one in four Hong Kong residents is considering emigrating because of air pollution – close to two million people. To be sure, there is not a mass exodus of workers from Hong Kong because of the poor air quality. The economy is thriving on Hong Kong’s position as gateway to China. Equally common complaints from companies seeking to attract international staff are sky-high rents and a lack of international school places. But air pollution does make a difference, particularly in industries such as banking where there are similar jobs in nearby cities like Singapore that have much better air quality. Australian Sara Foster moved to Singapore from Hong Kong with her toddler son and husband in May and says the difference in air quality is tangible. Her husband, who works long hours outdoors as a tennis coach, no longer needs to use medication to control his asthma. “Air pollution was definitely a factor in our move, besides education and job opportunities,” she says. In the American Chamber of Commerce’s latest survey of its members published in January, 68% said air pollution had worsened over the past 12 months and 48% knew of professionals and their families leaving Hong Kong in pursuit of cleaner air. There are few signs that Hong Kong’s air pollution is improving. The city’s air pollution index was at the “very high” level – above 101 on the government’s own air pollution index (API) – for 34% of the time during January to March, compared with 11% in the same period in 2010. At “very high” levels, children, the elderly and those with heart problems are advised to stay indoors. And campaigners claim Hong Kong’s API is more than 20 years old and permits pollution levels two to four times greater than the maximum levels recommended by WHO guidelines. Vivian Lee, a 45-year-old receptionist, says her family decided to move to Lantau, one of Hong Kong’s less densely populated islands to escape the poor air. “It’s really terrible in the city with all the buses and the tall buildings. We wanted to be where the air is fresher,” she says. In April, according to satellite data analysed by Hak-kan Lai, an assistant professor at the University of Hong Kong, the city has some of the worst air quality in the world. It ranked fourth worst for air quality out of 17 cities, trailing Guangzhou, Macau and Bangkok. 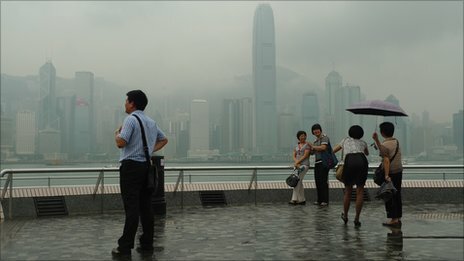 “It’s only a snapshot but it’s really alarming that our air quality is worse than Beijing and Shanghai,” Mr Lai says. Officials have long blamed factories in China for the city’s dirty air, particularly in autumn and winter when prevailing winds blow from the north. But environmentalists say much of the problem lies closer to home. Arthur Lau, a researcher at the Hong Kong’s University of Science and Technology, says the city is the main source of its own pollution around half the time, with roadside pollution the main culprit. Hong Kong has many green areas, with 40% of land reserved for nature conservation and recreation. But this means most of the city’s seven million residents live and work in less than 25% of the land that is developed, leading to one of the highest traffic densities in the world – 275 vehicles per kilometre. Roadside pollution is also magnified by a street canyon effect created by the wall-like, high rise buildings that line many of the city’s roads. Yet the city has no congestion charge or road pricing scheme such as those found in London or Singapore. However, some progress has been made. The government says it is likely to meet a target to cut emissions of major pollutants, by at least 20% from 1997 levels, by 2010 – largely by retro-fitting the city’s largest coal-fired power plant with emission control devices. And a law banning drivers from idling engines will take effect in September after 10 years of debate. But critics say that the law, which allows for 20 exemptions, will do little to ease roadside pollution, which is caused by trucks and buses with outmoded engines. Drivers caught parked with their engines running will be fined 320 Hong Kong dollars (£26; $41) but the ban will be suspended during very hot or stormy weather. Cab drivers at taxi stands will also be exempt, as will buses and school vans – and drivers will also be able to idle their engines for three minutes every hour without being charged. “It will make only a marginal difference, if any,” says Joanne Ooi, of Clean Air Network, a pressure group. I write on behalf of several green groups (http://greenerairport.blogspot.com) regarding the proposed expansion of Hong Kong airport. The Airport Authority recently announced the Hong Kong International Airport Master Plan 2030, proposing two options. Option one is to maintain the existing two-runway system; the second is to expand with a third runway. We are disappointed with the authority’s bias during its public consultation process, in which it has emphasised the need for a third runway. It has trivialised the impact this runway would have on Chinese white dolphins by altering the dolphin distribution map published by the Agriculture, Fisheries and Conservation Department. A total of 650 hectares of ocean would go permanently if the runway was built. Dolphin expert Samuel Hung has said the proposed third runway is at the intersection of three core areas vital to dolphins. The damage to marine ecology will be so great that environmentally friendly reclamation methods will be of little help. The aviation industry emits large amounts of carbon dioxide (CO2) and air pollutants. It contributes 4 per cent of Hong Kong’s total carbon emissions. CO2 released at high altitudes contributes more to the greenhouse effect than at ground level, but such data is not mentioned by the authority in the consultation documents. Polluting facilities, including power plants, already exist in north Lantau and Tuen Mun. Major projects are also planned for the area, including waste incinerators and the Hong Kong-Zhuhai-Macau bridge. There is too great a concentration of these infrastructure projects. Total reclamation will create a huge carbon footprint and severely worsen air pollution. More discussion and research are required, as environmental issues plus other factors like airspace constraints, noise pollution, construction costs, demand forecasts and co-operation with Pearl River Delta airports are involved. To avoid wasting HK$136.2billion in taxpayers’ money, the government and Airport Authority should not make a hasty decision that may result in the creation of a white elephant. Handle environmental issues properly even before the mandatory environmental impact assessment process. Environmental law organisation ClientEarth has issued judicial review proceedings against the UK Government. ClientEarth is bringing the case to make the government protect people’s health from toxic levels of air pollution in towns and cities. In the UK, 29,000 people die prematurely every year because of air pollution – more people than die, or sustain serious injuries, in road traffic accidents. The judicial review is a legal challenge to the failure of the UK Department of Environment, Food and Rural Affairs (Defra) to produce plans that will bring nitrogen dioxide (NO2) within legal limits by 1 January 2015, and for refusing to consult the public on its latest plan for reducing dangerous airborne particles (PM10) in London – despite ClientEarth reminding them in April of their legal responsibility to do so. US$68.9b in foreign investment – but where did it all go? Yesterday InvestHK conducted its annual farce at the announcement of foreign direct investment figures produced by the United Nations Conference on Trade and Development. Simon Galpin, director general of InvestHK, sat on the podium looking like the cat that had got the cream when he announced with evident pleasure that Hong Kong had moved into third place behind the United States and China and had apparently received an astonishing US$68.9 billion in FDI last year. “This is very significant for an economy of only seven million people,” gushed Galpin. Indeed it is – and you would have thought he might have been a tiny bit sceptical. However, on he went to explain how Hong Kong’s wonderful business environment had been able to attract more investment than most of the rest of Asia put together. According to Professor Wong Tak-Jun, the dean of the Faculty of Business Administration at the Chinese University of Hong Kong – who shared the podium with Galpin – this is not hot money or portfolio investment in the stock market, this is money that is invested in Hong Kong and stays here. Let’s put this in perspective. The Hong Kong-Zhuhai-Macau bridge is estimated to cost US$10.7 billion so we have the equivalent of at least six of those. We could also afford at least eight high-speed railways of the kind between Hong Kong to Guangzhou. The combined IFC1 and IFC2 complex cost HK$20 billion, so according to InvestHK foreign investors put in enough funds last year to build 26 of these vast complexes. Yet they don’t know where the investment went. If somebody stumbles across a hitherto undisclosed US$68.9 billion of infrastructure could they let InvestHK know? According to the International Monetary Fund, FDI is defined as when an investor based overseas acquires an asset in one country with intent to manage that asset. Another statistic Galpin downplayed was that Hong Kong was ranked fourth for outward FDI, which interestingly came to US$76 billion and was rather more than flowed in. This might explain why we haven’t seen 20 IFCs sprouting up in Hong Kong. So come off it, InvestHK. Stop this nonsense. We are supposed to be Asia’s world city where we do things properly and not play these silly games. I refer to your editorial on Hong Kong’s environmental impact assessments (“Impact assessment in need of review”, July 22). It is timely given that I am involved in opposing plans for building an artificial island together with a mega waste incinerator beside southwest Shek Kwu Chau, in the otherwise unspoiled waters along southern Lantau. I considered the EIA report on possible sites for waste incinerators to be strongly biased towards making the Shek Kwu Chau site appear a viable choice, and deficient concerning potential pollution, as well as impacts on scenery, biodiversity, and Hong Kong people’s quality of life. So when I attended a public session of an Advisory Council on the Environment subcommittee meeting on the report, I looked forward to hearing some strong criticisms, with ACE members pointing out the report’s many shortcomings. Instead, there was little of substance and to my mind the subcommittee functioned largely as a rubber stamp for the report. What also struck me was that though the meeting included government officials and consultants, together with ACE members, it appeared not one person present was an expert in waste incineration. Indeed, after a little research I felt better informed than most people who spoke. In this case, then, the EIA process was particularly deficient. Not only was the government both proposing and judging a project that would cause environmental damage, but the EIA was discussed by a government-appointed body, with ACE chair Paul Lam Kwan-sing admitting that members lack certain expertise (“Green law has limited impact”, July 19). The government subsequently withdrew the EIA report, after a judicial review found serious issues with the EIA for the Hong Kong-Zhuhai-Macau bridge. This suggests that though ACE passed the report, the government lacks confidence in it. Clearly, a better system is needed, not just a bureaucratic mechanism. I believe there is a case for leadership coupled with true dialogue with Hong Kong people; both are sorely lacking at present. The choice of Shek Kwu Chau for the artificial island where the incinerator is planned has arisen not through vision, but through the government fumbling for a strategy, with a series of consultations, reports and committee meetings that have failed to tackle the root causes of Hong Kong’s waste problem. “As you move away from the equator, there’s less and less light available, so humans have had to evolve bigger and bigger eyes,” said Eiluned Pearce from the Institute of Cognitive and Evolutionary Anthropology at Oxford University, a lead author on the study. This suggests that someone from Greenland and someone from Kenya will have the same ability to discern detail, but the person from the higher latitude needs more brainpower and bigger eyes to deal with the lower light levels. Professor Robin Dunbar, director of the Institute of Cognitive and Evolutionary Anthropology at Oxford University and a co-author of the study, said that people whose ancestors have lived within the Arctic circle, have eyeballs 20% bigger than people whose ancestors lived near the equator. They have an associated increase in the size of the brain’s visual cortex, which previous studies have shown correlates with the size of the eyeball. Brain volume is known to increase with latitude: people living at high latitudes north and south of the equator have bigger brains than people living near the equator and . Dunbar said that scientists have wondered whether these inherited differences in total brain volume were driven by the pressure to adapt to low light levels at high latitudes. The researchers measured the brain volumes and eye sockets of 55 skulls kept at the Oxford University Museum of Natural History dating from the 19th century. The skulls represented 12 different populations from around the world, including indigenous people from England, Australia, China, Kenya, Micronesia and Scandinavia. The results, published on Wednesday in the journal Biology Letters, showed that the biggest brains, averaging 1,484 millilitres, were from Scandinavia, while the smallest brains, around 1,200 millilitres, came from Micronesia. Average eye socket size was 27 millilitres in Scandinavia and 22 millilitres in Micronesia. The researchers controlled for possible confounding variables influencing their data, such as the fact that people who live at higher latitudes are physically bigger and the possibility that the size of a person’s eye socket in colder climates might be bigger to allow for a thicker layer of insulating fat. The results for human eyes mirror those found in birds and non-human primates. Bird species that sing earlier in the dawn chorus at high latitudes have bigger eyes than those that sing later, and nocturnal primates have bigger eyeballs than species that are awake during the day. The mainland will see a significant rise in non-communicable diseases in the next two decades, and a big financial loss as a result, if it fails to effectively contain the trend, a new World Bank report says. In the report, released in Beijing yesterday, the number of non-communicable diseases (NCDs) – chronic problems such as cardiovascular and respiratory illnesses, cancer and diabetes – among people over 40 will double or even triple over the next two decades if effective prevention strategies are not implemented. Communicable diseases account for more than 80 per cent of annual deaths and contribute to 68.6 per cent of the total disease burden, the report said. The rising tide of NCDs stems from the ageing population and unhealthy lifestyles, including the high smoking rates among males, growing obesity due to increased consumption of fast foods and sugar-rich soft drinks, and decreased physical activity in cities, according to the report. Cardiovascular diseases, strokes and diabetics will result in financial losses of US$55 billion from 2005 to 2015, whereas estimates given for the mainland indicate that the economic benefits of reducing cardiovascular diseases by just 1 per cent per year, over a 30-year period, could generate an economic value equivalent to 68 per cent of the country’s real GDP in 2010, more than US$10.7 trillion, the report says. It identifies the next 10 years as a critical time for the mainland to prevent and control the trend, saying it can be curbed or managed by adopting good practices. “Cost-effective policy options exist for adopting a comprehensive multi-sectoral response to deal with NCDs in China,” said Wang Shiyong , a World Bank health specialist and the lead author of the report. Patricio Marquez, a World Bank health specialist and the report’s co-author, recommended stricter tobacco and alcohol controls, such as higher taxes and the restriction of smoking in public places, as well as well-organised and better-funded primary health care services. Last weekend’s fatal bullet train crash in Wenzhou has triggered a searching reassessment of China’s massive high-speed rail investment programme. It should also prompt the Hong Kong government to reconsider its plans to spend HK$67 billion on an express line to connect to the mainland’s network. Saturday’s accident, in which one high-speed train smashed into the rear of another killing at least 35 passengers and injuring hundreds, rammed home a point that was already fast becoming clear after a series of problems on other lines: China’s new high-speed rail system is failing to live up to its publicity. Mainland officials have boasted that their new trains are far more advanced technologically than Japan’s shinkansen. But there are plainly deep flaws with the signalling and traffic management systems that have been installed to run China’s new network. High-speed rail systems elsewhere in the world employ fail-safe cut-outs that make it impossible for two trains to occupy the same section of track at the same time; an essential feature when the trains may be travelling at speeds of up to 300km/h. And those cut-outs are designed to work despite power failures, lightning strikes or human error. Just last month, for example, a lightning strike triggered a shutdown of London’s Heathrow Express service. Alas, the control systems on the Shanghai-Wenzhou line obviously were not up to the job. The immediate result was Saturday’s crash. The longer term effect may be a major blow to public confidence in a network that critics say is already failing to attract customers in anything like the numbers forecast. For Hong Kong’s planned high speed line, that means the risk is not – hopefully – a physical crash, but rather a financial train wreck. The Hong Kong government justifies its plan to spend HK$67 billion on a 26 kilometre line to Shenzhen by claiming that 100,000 passengers a day will use the new service when it opens in 2016, generating more than HK$1 billion in revenue in its first year at an operating margin of 34 per cent. Unfortunately, there are powerful reasons to believe these figures are wildly optimistic. According to a 2005 study published by the World Bank, government officials around the globe deliberately understate the cost of railway projects and overstate traffic projections to secure funding approval. After adjusting for inflation, costs typically overshoot by 45 per cent. Actual passenger numbers usually turn out to be fewer than half those projected. If the Hong Kong government’s projections for its planned high-speed rail line are as wide of the mark as the World Bank study suggests, the actual cost of the new railway will not be HK$67 billion, but HK$97 billion. And first year revenues will not be HK$1 billion but more like HK$570 million, which means the an operating loss from day one. And in the longer run, the economic benefits during 50 years of operation will not be HK$87 billion, as the government claims, but a mere HK$42 billion (at 2009 prices). At that rate it will take the new rail line 118 years to cover its construction costs. In short, Hong Kong’s new high-speed rail link shows all the signals of a financial disaster in the making. In the aftermath of the Wenzhou crash, the government should take the opportunity to reconsider its plans, and abort the whole project before it wastes any more of the public’s money. For lovers of numbers, here are some statistics from Professor Mike McConville at Chinese University of Hong Kong, who has just published the results of a 12-year study of the mainland’s judicial system, for which his team reviewed 1,144 criminal cases, monitored 227 trials and interviewed 88 judges. First, it takes 14 years of tussle to enact a law regulating vehicles parked with engines running. But instead of being an effective tool in combating roadside air pollution, it has been heavily watered down with a package of exemptions to appease the transport industry. The latest bad news is that enforcement will be delayed until December, with an initial one-month grace period. One cannot help wonder how determined the government is to protect public health. The reason for the delay appears to be nothing more than a lame excuse. Despite a clear undertaking to enforce the ban in early September, officials told a Legco panel that the understanding had always been that the law would not commence during the hottest days of the year. That lawmakers feel betrayed is understandable. Officials were either misreading the temperature records in autumn, or they were never sincere in setting the promised deadline when lobbying for support from lawmakers to pass the bill in March. Sadly, the comfort of those sitting inside an air-conditioned vehicles is clearly more important than the risks for those choking on exhaust fumes outside. Regulations specifying arrangements for the HK$320 infringement penalty will not be ready for gazetting until next month. By the time the ban comes into force in December, as freshly promised, it will be 10 months since the ordinance was passed. Of more concern is the lack of enforcement manpower. The 260 wardens currently policing other traffic-related offences will also be required to enforce the ban. The plan to train up just another 18 officers to cope with the new law does not do justice to a law which potentially affects hundreds of thousands of vehicles. This raises doubts about how effective the law will be.